We are waiting for you to spend a unique experience together! Hotel Alexander is an elegant 4-star hotel located in Gabicce Mare. Ideal for those who want to relax, for those who love sports and for families with children. It has a heated swimming pool and hydromassage, a garden, a restaurant with gluten-free menus, a wellness area, a meeting room, routes for cyclists and agreements for golfers and tennis players. Admits animals of small and medium size according to availability. The hotel is located in Gabicce Mare in a panoramic area, surrounded by the green of the San Bartolo natural park. It is just a few minutes' walk from the beach and the town center. The hotel has four types of rooms, which differ in size and services offered. SMERALDO: room of 21 square meters with a balcony overlooking the sea side, flat-screen satellite TV, hairdryer and courtesy set, safe, air conditioning and afternoon refresher of the room. ZAFFIRO : has all the comforts and a large balcony with sea view. It measures 23 square meters and at the services of the Smeraldo room adds a fresh fruit basket upon arrival, a bad towel, the minibar drinks included in the price and a corner for the preparation of tea and coffee. DIAMOND: soundproof room of 22 sqm with balcony facing the sea, TV sat, bottle of prosecco upon arrival and all the services of the Sapphire room, plus the possibility of breakfast in the room, bathrobe, favorite newspaper every morning, scale and bike electric pedal assisted. FAMILY ROOM: it's the ideal solution for family holidays. Large 40 square meters, divided into 2 connecting rooms and has all the services of the Smeraldo room. Heated pool and Jacuzzi, garden, free use of city bikes depending on availability, reading room, meeting room, lift, fitness area with Technogym equipment, wellness area with sauna, massage corner and sun shower, bar with satellite TV and Sky package , billiard room and burraco hall. Also beach towel, laundry (for a fee), bike rental and e-bike, ad hoc services for cyclists, golfers and tennis players. Organize theme nights, boat trips, cultural and food and wine excursions. PARKING: covered, private adjacent to the hotel and free. AIR CONDITIONING: all rooms are air-conditioned without additional costs. 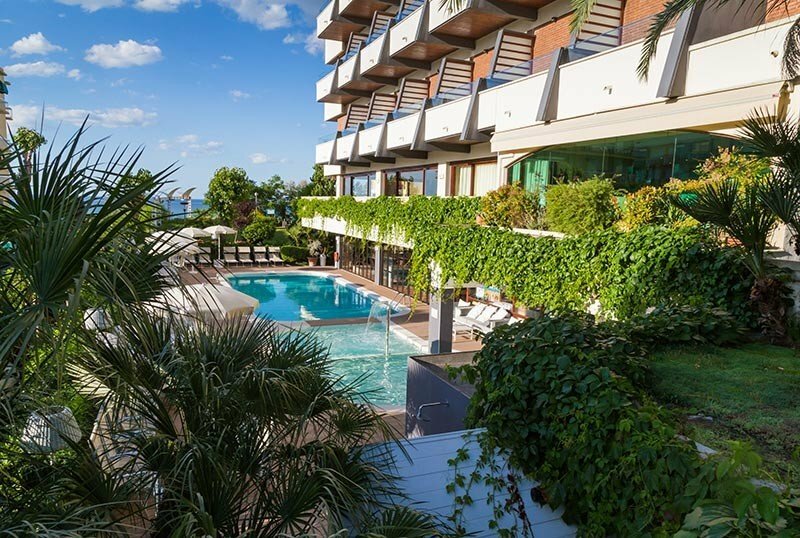 CONVENTIONS: beach, amusement parks, swimming pool, golf course and tennis court, Baia degli Angeli Tennis Club, shuttle service that accompanies guests from the beach to the hotel. PETS: small pets allowed depending on availability. There is a supplement for final cleaning of the room. BREAKFAST: buffet, to be enjoyed in the garden or by the pool, with cakes, pastries, pancakes, croissants, different types of bread, meats, cheeses, eggs with espresso and a corner with organic products and gluten intolerant, all accompanied from the service to the table of hot drinks. LUNCH AND DINNER: lunch is buffet style and includes a wide selection of hot and cold appetizers, seasonal vegetables, pasta dishes served at the table, barbecues of meat and fish, fresh fruit, sorbet, ice cream and desserts. Dinner à la carte menu is accompanied by an extensive selection of wines and followed by homemade pastry, desserts or cakes. VARIATIONS: there is a Gluten Free menu for guests intolerant to gluten (AIC certification) and attention to allergies and intolerances. OTHER: every evening Happy Hour at the bar. In hotel: swimming pool for children, bicycles with child seat. On request: pediatric counseling and paid baby sitter service. In the room: cots and cribs with banks. At meals: high chairs, cutlery, plates, place mats, baby food, snack every afternoon. The outdoor swimming pool is composed of a 98 sqm pool, a 12 m2 pool dedicated to children and a 12 sqm heated hydromassage, 9 sqm wide and equipped with a waterfall for cervical massage. Around the pools there is a solarium area with beach umbrella and sunbeds. 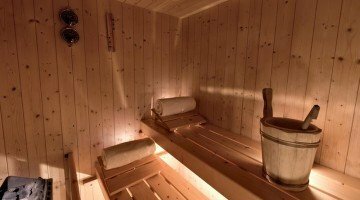 The hotel's wellness center features a Finnish sauna, a UVA sun shower, a massage cabin and a fitness area. Cycling: safe deposit for 80 video surveillance bicycles, workshop corner for small repairs, maps and routes, expert guides available, tours and special packages, bike and e-bike rental, laundry for technical clothing, a rich buffet until 16:00, fitness area with Technogym equipment and masseur. Golf: Green Fee reservations, special packages for golfers and escorts. Tennis: agreements with Baia degli Angeli Tennis Club with 4 courts (2 in red and 2 synthetic) 20 meters from the hotel, with teachers available for lessons at all levels. Motorcycling: covered parking for motorcycles, washing corner with pressure washer, shoe drying in case of rain. The Alexander Beach, at the baths 42 and 44, is a reserved area on the beach of the bay of Gabicce Mare that offers guests cabins, hot showers and many amenities such as a playground for children, table tennis, pedal boat rental and blowflies. The hotel also offers personalized beach towels with daily change and shuttle service to the hotel. Prices in Room Smeraldo, Zaffiro and Diamante are per day per person for a minimum stay of 3 nights. VAT and services included, prices not valid for large events and fair periods. Prices in Family Room are per day per room for a minimum stay of 3 nights. ALL INCLUSIVE "SILVER" € 19.00 per adult per day: water, local wine and soft drinks during meals + Beach service (Beach umbrella and sun loungers at Alexander Beach - 42/43 - excluding the first two rows) + Use of a beach towel for the beach. ALL INCLUSIVE "GOLD" € 25.00 per adult per day: water, local wine and soft drinks during meals + Non-alcoholic drinks and coffee consumed at the hotel bar + Minibar drinks in the room + Beach service (Beach umbrella and sun beds) beach Alexander Beach - 42/43 - excluding the first two rows) + Use of a beach towel for the beach. ALL INCLUSIVE "EXCLUSIVE" € 30.00 per adult per day: water, local wine and soft drinks at meals + Non-alcoholic drinks and coffee consumed at the hotel bar + Minibar drinks in the room + Beach service (Beach umbrella and sun beds) Alexander Beach - 42/43 - excluding the first two rows) + Use of a beach towel for the beach + n ° 1 tasting in the vineyard + n ° 1 excursion and aperitif on the boat. - Double Room for Single Use: from € 25.00 to € 35.00 per day. - Hotel Formula + Beach: From 01/06 to 16/06/19 and from 01/09 to 12/09/19 the beach service (Bagni 42/44 ): 1 umbrella + 2 sunbeds, excluding the first 2 rows is included in the price for a minimum stay of 7 days with Half Board treatment in Sapphire or Diamond room. - Upon confirmation of booking we will ask you for a deposit equal to 30% of the value of your stay. - In the months of April / May / September: in case of no show or cancellation within 7 days from the date of arrival, cancellation will be free (the amount of the deposit will be refunded or no penalty will be charged on the credit card provided) ; after this period the deposit will be retained or debited from the credit card for the amount of the deposit. - In the months of June / July / August: in case of no show or cancellation within 14 days from the date of arrival, cancellation will be free (the amount of the deposit will be refunded or no penalty will be charged on the credit card provided) ; after this period the deposit will be retained or debited from the credit card for the amount of the deposit. - In case of early departure, any facilities or discounts granted will be canceled. Treat yourself to a perfect mix of sea, sport and relaxation! Play tennis in our clay courts 50 meters from us, soak up the sun on the beach and relax with a massage. Hotel Alexander is the ideal location for golfers and their companions, to whom we offer an unsurpassable holiday full of sports, entertainment, relaxation, sea and excellent cuisine. Double room (Sapphire) equipped with all comforts and balcony with sea view. We are the ideal location for golfers and their companions, to whom we offer a holiday full of sports, many ad hoc All Inclusive services, fun, relaxation, sea and excellent cuisine. Afer a bike tour relax yourself with a yoga class with our qualified teacher. The lessons are also open to non-cyclists. For a stay of at least 7 nights, we offer you umbrella and cot FREE (excluding the first 2 rows) at the Alexander Beach - Beach 42/44. This offer is valid for the Zaffiro or Diamante rooms with half board or full board. We wait for you under the umbrella!